Each school has a dedicated and caring international student coordinator who is the first point of contact for international students. The coordinator will conduct orientation programs, introduce students to key staff at the school and provide ongoing support throughout the enrolment process at school. Each academic year is assigned a year adviser who monitors the academic progress of all students in that year. The year adviser works closely with the school’s learning and support team and classroom teachers to help students achieve academic success. 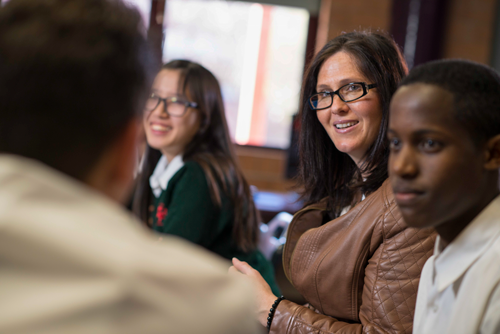 The careers adviser provides guidance to students in areas such as subject selection, career planning, selecting appropriate tertiary study options and preparation for entering the workforce. Students may also access our dedicated team of multilingual DE International staff and student advisors who provide additional support and individualised support services to international students. Specialist teachers provide ongoing assistance to students during their enrolment in a high school. They teach students the English language and literacy skills needed in all subjects. Many of our schools have bilingual staff who will be able to communicate with parents and carers in their own language. This team looks after students’ welfare. They help students to settle into their school and assist with any personal or study related issues. The head teacher looks after the well being of all students and the team provides guidance and support as required. All matters discussed will be treated confidentially. Many schools have homework centres and provide free tutoring for students after school. Teachers supervise students’ completion of homework and provide advice on queries they may have regarding coursework.